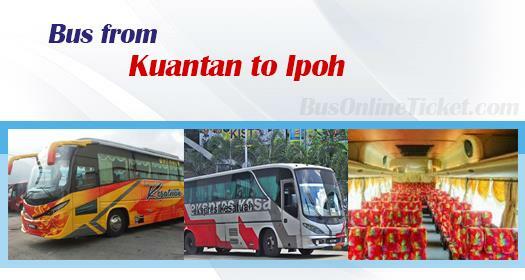 Bus from Kuantan to Ipoh is one of favourite direct bus service connecting Malaysia two famous cities. Passengers travelling between the cities for various purposes like working, meeting and tertiary education study. Besides that, bus from Kuantan to Ipoh also offers a chance for Kuantan residents to visit Ipoh's hottest new destination, Movie Animation Park Studios (MAPS). Many travellers prefer bus to flight for travelling from Kuantan to Ipoh. The reason because flight from Ipoh to Kuantan is a multi-stop flight, the flight duration from Kuantan to Ipoh could possibly be significantly longer and more tiring than taking a bus. Kesatuan Express is the only bus company offering bus from Kuantan to Ipoh. Kesatuan Express is one of the well-known brand in Malaysia with its headquarter in Ipoh. Kesatuan Express provide limited bus schedule for this bus route. The bus schedules are in the midnight 12.30am while the another one is in the evening 6.30pm. The bus fare from Kuantan to Ipoh is fairly charged. Bus fare for adult is at RM 44.00 whereas bus fare for child is at RM 34.00. The duration required for this bus route takes about 6.5 hours depending on the traffic and climate condition. Generally, 1 stopover is arranged in the mid of the journey for break. In the event of urgent washroom break needed, passengers can always approach the driver. The departure point in Kuantan is at Kuantan Sentral Bus Terminal whereas the arrival point in Ipoh is at Aman Jaya Bus Terminal. For passengers visit MAPS theme park, they can take a 5-minute taxi ride to Asia's first animation theme park, the Movie Animation Park Studios (MAPS). MAPS featured around 23 interactive attractions and 15 rides over six thematic zones based on animation films like Smurfs, Megamind, and The Croods. Due to limited availability of seats, passengers are recommended to book your bus ticket online via BusOnlineTicket.com. Book your bus tickets in advance could avoid disappointment. Grab your bus ticket now before sold out!